FAYARD DE LA BRUYERE - Atlas universel, Plan de Melbourne (Australie). FAYARD DE LA BRUYERE, A. / BARELLE,A. - Atlas universel, Plan de Melbourne (Australie). Atlas universel, Plan de Melbourne (Australie). - FAYARD DE LA BRUYERE, A. / BARELLE,A. Title : Atlas universel, Plan de Melbourne (Australie)..
Map maker : FAYARD DE LA BRUYERE, A. / BARELLE,A.. Size : 16.7 x 10.9 inches. / 42.5 x 27.8 cm. 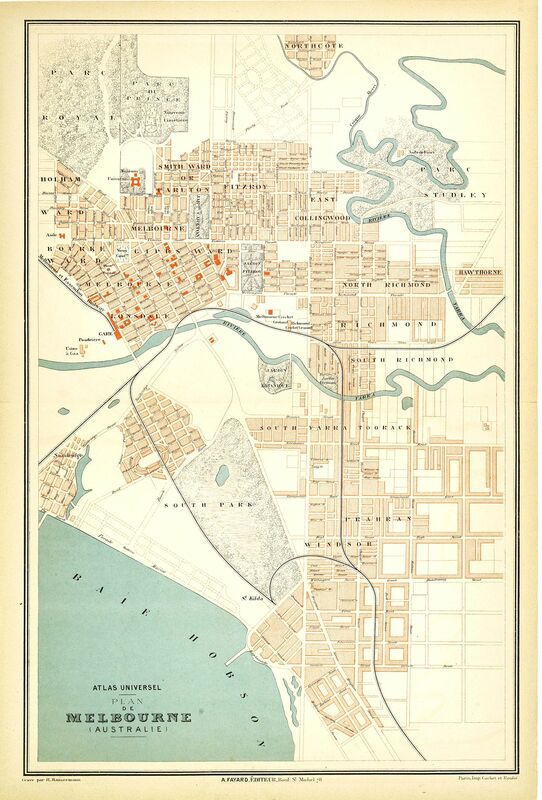 Description :Early street map of Melbourne showing the inner suburbs of Melbourne from North coast in the north to Brighton in the south including parks, railways and gardens. Printed by Cochet et Roulie´. From "Atlas universel contenant la ge´ographie physique, politique, historique, the´oretique, militaire ..". Condition : Lithography in printed colours. Very good condition.